Copyright, 1883, by Hubbard T. Smith. Words and Music by Hubbard T. Smith. 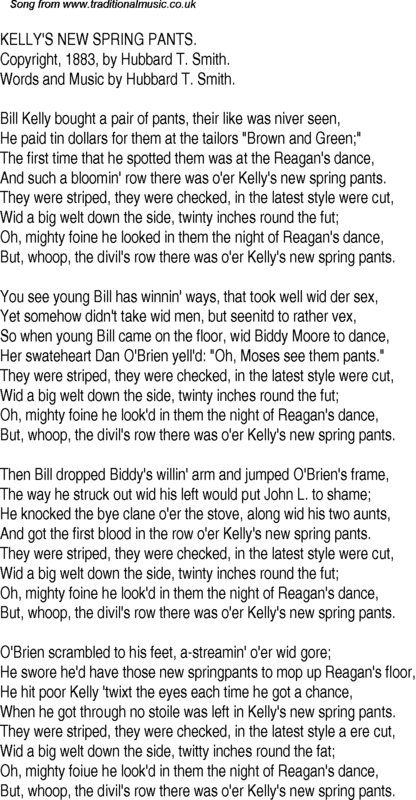 He paid tin dollars for them at the tailors "Brown and Green;"
And such a bloomin' row there was o'er Kelly's new spring pants. But, whoop, the divil's row there was o'er Kelly's new spring pants. Her swateheart Dan O'Brien yell'd: "Oh, Moses see them pants." And got the first blood in the row o'er Kelly's new spring pants. When he got through no stoile was left in Kelly's new spring pants.